“Follow me” are two simple words that can change a life. Jesus was walking along the Sea of Galilee and saw Levi, a tax collector, and invited him to follow. Levi did. His life was changed forever. In the next paragraph, Levi is in his house with many guests. They are identified as tax collectors and sinners along with Jesus and His disciples. Levi not only had his life changed, but he invited others to meet Jesus. When we follow Jesus and subject our will and wishes to God’s guidance, life becomes a new creation. No longer are we trying to govern our lives alone, doing whatever we please, but we have the Lord of Life directing our ways. We are trying to please God who created us, saved us, and sustains us. Each day we are simply expressing our thanks to God who is the Giver of all good gifts. Is following Jesus easy? No. We battle our selfish desires continually. But thanks be to God who helps us every day. He is Emmanuel, God with us. How can God help you today? And who can you introduce to Jesus? 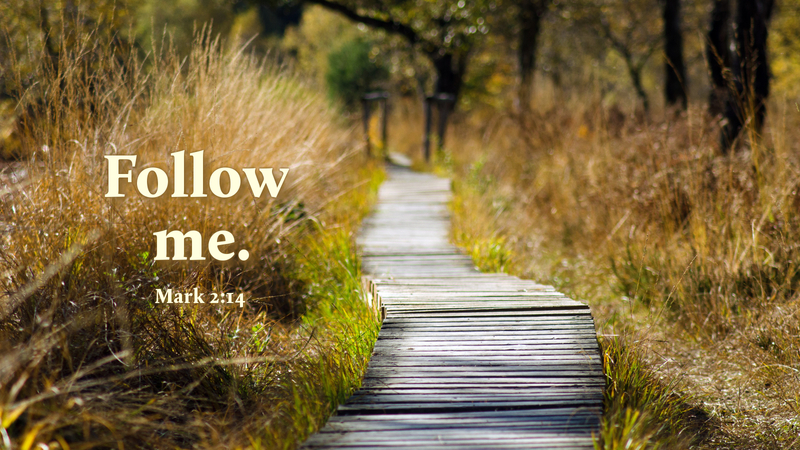 Prayer: Thank you, Lord, for calling me to follow you. Amen.